Today is New Years Day, which to this foreigner means more or less one thing - almost all businesses are closed. 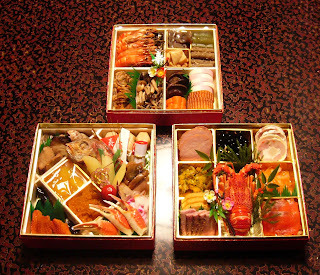 Most people spend New Years Day at home with the family eating the expensive, rarified, celebratory, traditional, and let's face it, not very tasty foods known as osechi ryôri. Consisting mostly of pickled vegetables and obscure fish products, osechi foods are chosen more for the auspiciously homophonic qualities of their names than for their taste, which doesn't keep New Years lunch boxes from costing in the tens if not hundreds of dollars. 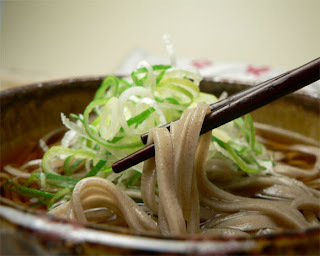 The other traditional New Years food is toshikoshi soba - buckwheat noodles to be eaten at the start of a new year so as to achieve long life. I had already taken care of my toshikoshi soba in Shinjuku late last night, but I thought I should try and see if I couldn't scare up some toshikoshi chûka soba - in otherwords, ramen for the new year. I hopped on my bike and decided to see what I could find open, but unsurprisingly, almost every store along Waseda-dôri was shuttered. That said, New Years Day in central Tokyo is much better than in Kyoto or in the suburbs, at least in terms of trying to find something other than a convenience store to grab lunch at. I cruised all the way west to Otakibashi, and found a few shops (like Botan and Ryûkô Tantanmenbô) to be open, but I wanted to try something new. (These first three photos borrowed from the web). In the end, I came back to the station area, and just as I was about to throw in the towl and submit myself to Shakey's all-you-can eat buffet of marshmallow pizza, potato corn pizza, and bad spaghetti, I spied the lights on at Shitennô. The lights were on, but the place was pretty deserted. The only souls in the house besides myself were a couple of yakuza-looking guys eating by themselves. Inside, Shitennô was fairly non-descript, with a large center cooking area surrounded by counters on three sides and a couple tables tucked away in the back. 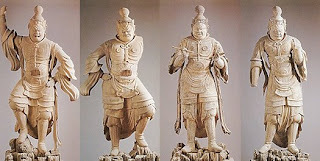 Shitennô takes its name from the Four Heavenly Kings, the Devarajas who have traveled across time, space, mythology, and ideology from ancient Hindu India through Tang China to modern Japan to become protectors of the Dharma and, perhaps less auspiciously, ramen shop logos. 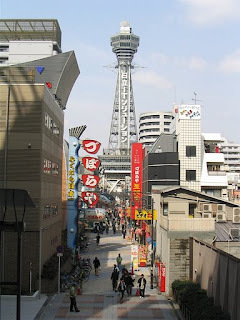 Most likely, however, is that Shitennô, a nationwide chain, which traces its roots back to the inimitable street of South Osaka known as Dôtonbori, decided on the name due to its proximity to Osaka's Shitennô-ji temple, built in 593 by Prince Shotoku, the figure traditionally accredited with Japan's adoption of Buddhism. Shitennô-ji is generally recognized as one of the oldest temples in the country and is a landmark of Southern Osaka, as well as the namesake of one of the craziest neighborhoods in Japan; the kind of neighborhood where homeless people try to sell you model ships made out of deerskin before watching you pee. But that's another story. Sadly, Shitennô's ramen couldn't live up to the 1400-year pedigree of the temple from which it takes its name. I wavered a bit between the choice of shôyû, shio, and miso, all of them blended with tonkotsu. In the end, at the chef's recommendation, I decided to go with spicy miso with kimchi, since I hadn't had kimchi ramen in far too long. Toppings were pretty standard, with chopped green onions, a dash of sesame, and a pile of bean sprouts, apart from the kimchi. My first sip of the soup revealed a passable miso, pleasantly thicker and creamier than average, but also a bit too salty. The "spicy" came on the side, a red paste in a small dish to be added at one's discretion. I dumped it in, but it still didn't really make the soup spicy, just kind of blandly peppery. Sadly, the kimchi didn't fare much better; it tasted like pretty standard mass-produced Japanese-style kimchi (that is to say, a bit weak in flavor, and a bit acidic in the wrong way), a taste which overpowered the base miso taste of the soup a bit more than it should have, rather than blending with the flavors, as in a good bowl of Hakata ramen. Shitennô's bowl also fell victim to one of my personal pet peeves, an overabundance of toppings; granted I ordered the kimchi ramen, but when I get down to the bottom of a bowl and find just a few strands of noodles amidst a mess of bean sprouts, I get irked. I felt like I didn't even get that many full good bites of noodles before I was already getting half and half bites of noodles and bean sprouts. The noodles were nothing special either, very wavy and disconcertingly yellow, which is often a sign that they come mass-produced from afar. They certainly tasted like chain-store noodles, which, combined with the fact that there wasn't a lot of them, made Shitennô come out behind on the noodle front as well. It's not that Shitennô's ramen was terrible, it was just very "chain store." The salty broth, the weak kimchi, the factory noodles, the smallish portion all made me feel like Shitennô's bowl is the kind of ramen that often passes in America among people who don't know better. Shitennô served up one of my least favorite bowls of ramen thus far, and I have a hard time imagining another set of circumstances that would lead me back here, especially with so many other strong competitors around. There are plenty of big chains that serve up tasty ramen, like Ippûdô and even Kômen, but Shitennô just didn't do it for me. If you do not like Tendô Yoshimi, I am not sure I want to be your friend.